Somewhere between the gentle rolling hills and foggy mists of England, I fell in love with black tea. After moving to the United Kingdom for a few months, surrounded by a new culture and colorful accent, afternoon tea seemed like a very British tradition to experience. Up until this point, I had never been much of a tea drinker, perhaps only stealing a cup of chai when my mother set the teapot to boil, but I still felt like I would grow to enjoy it. Originating from a nation of coffee drinkers, tea sounded like a fresh, bright alternative to the acidic touch of a rudimentary coffee maker. I remember my first trip to a British supermarket well. I paced up and down the aisles with an unusual level of fascination with the food lining the shelves. When I reached the tea section, I needed to take a moment to look over the vast display, feeling overwhelmed with choosing a place to begin my tea journey. I looked over different boxes in earnest, but with no concept of the difference between Earl Grey and Rooibos or English and Irish breakfast tea, it all felt as foreign to me as the new country I was in. I eventually snatched a box of PG Tips off the shelf, gambling with my future in tea. Since that very first cup, brewed hot and fresh in my small dorm kitchen, I have not been able to turn back since. Black tea had utterly captured my heart. Even now, I much prefer a mug of black tea to a mug of black coffee. On the weekends, when the morning is slow and responsibilities have been forgotten, I boil the water and brew the tea, adding a splash of milk and a drizzle of honey. You could, in many ways, call it my drink of choice. 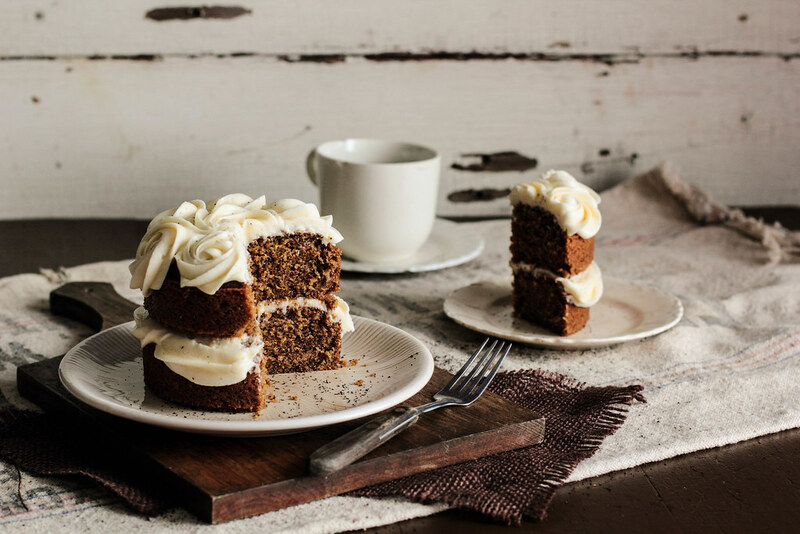 Last weekend, while sipping a mug of tea and watching a winter storm turn the world white outside my window, I envisioned the flavors of my cup of tea as a slice of cake. Staying warm in my apartment, I started up the oven and turned my faint imaginings into a reality, creating a lovely little cake for two. My boyfriend, a strong believer in the powers of a good cup of coffee, fought me for the final piece. I think that speaks more about this cake than anything else. 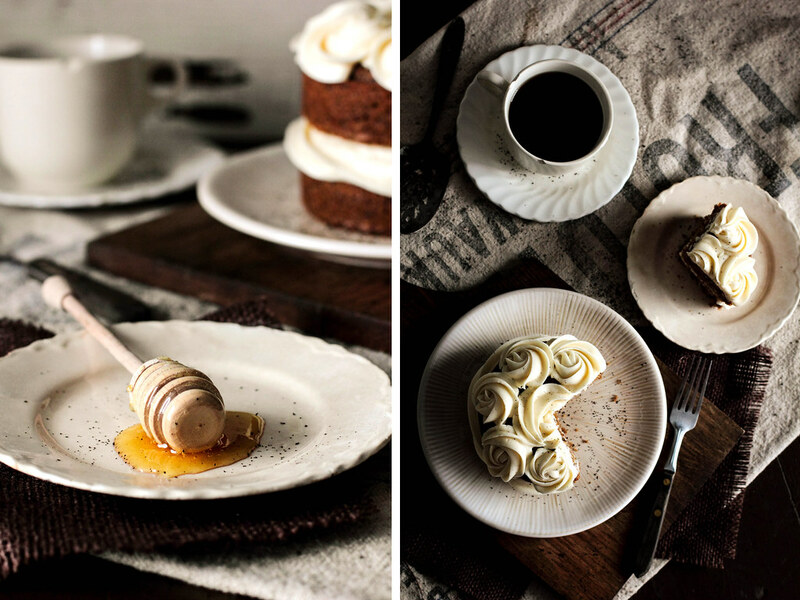 Black Tea Cake with Honey Buttercream is a cup of tea turned into a slice of cake. 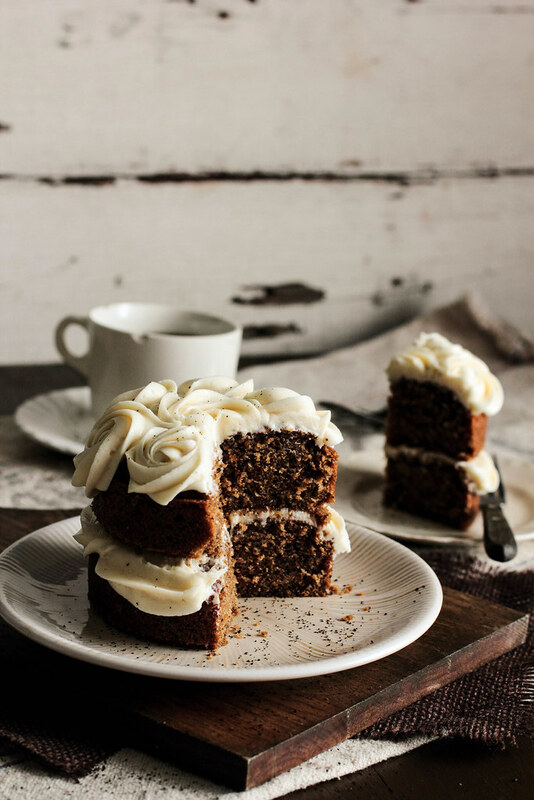 The black tea cake is made by pouring the contents of three tea bags into warmed milk and allowing it to brew before adding the milk into the cake batter, tea leaves and all. The batter takes on a wonderful color, with specks of tea leaves to add a unique twist. 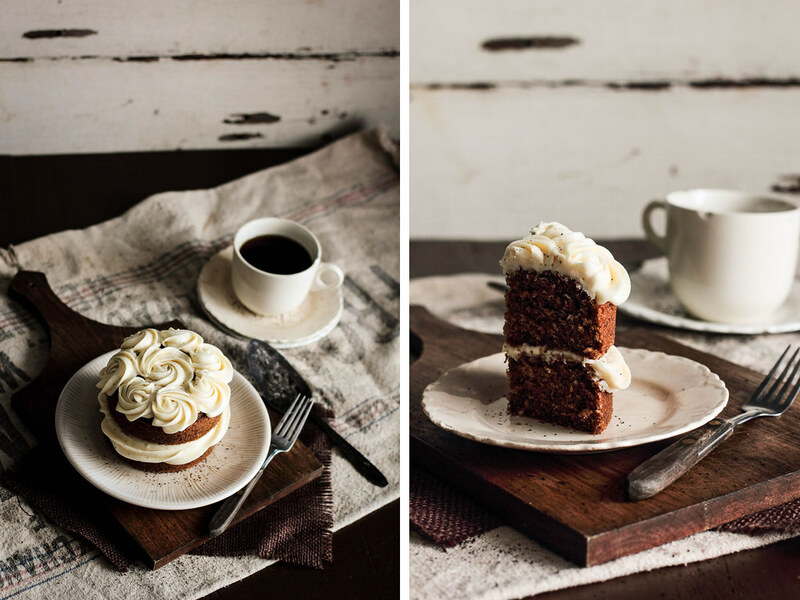 After baking, the cake is topped with a honey buttercream that keeps the flavor without so much of the sweetness. 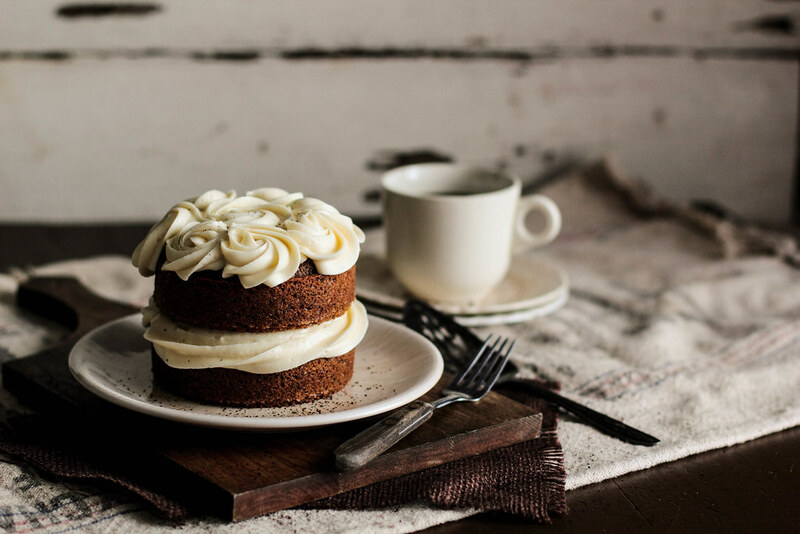 The cake and buttercream taste just as their namesake, giving the classic cup of tea a new life. 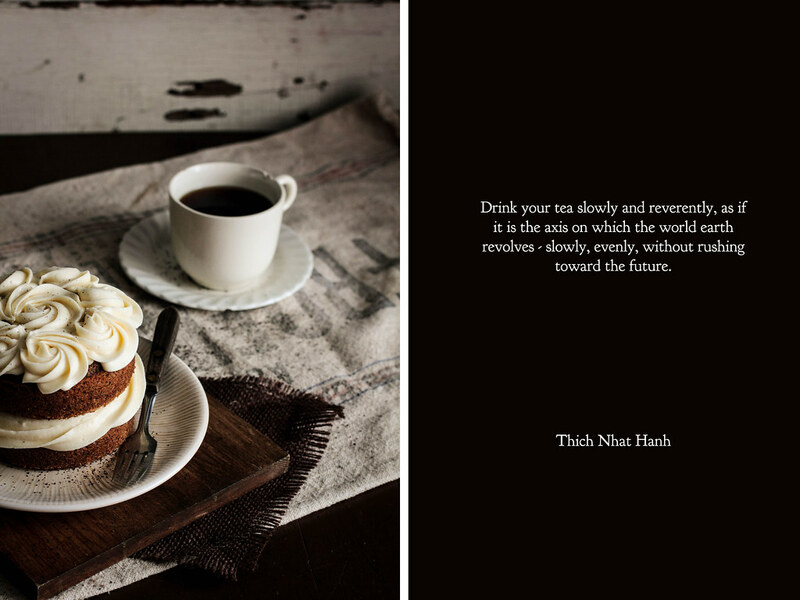 Tea lovers, this cake is just for you.